Video Games and White Truffles – What Could Be Better? I’ve covered lots of odd food trends over the years, but this one makes no sense, especially coming from the Michelin starred restaurant Quince, in San Francisco. If this was April 1st, I would have completely dismissed the story. 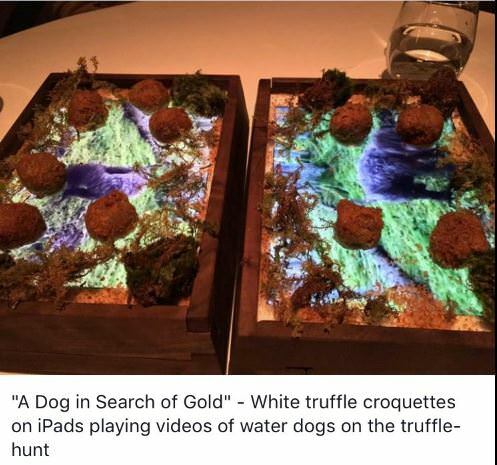 Quince has started serving a dish called “A Dog In Search of Gold”, described in a photo posted on Twitter as, “white truffle croquettes on iPads playing videos of water dogs on the truffle-hunt.” I’ll wait a moment while you click on the link and scroll down to the photo. It’s worth your time. I have to wonder why the restaurant is resorting to such gimmickry. Three Michelin stars should be bringing in plenty of business. Most people in the food community have heard of Quince, and serious eaters have dined there. 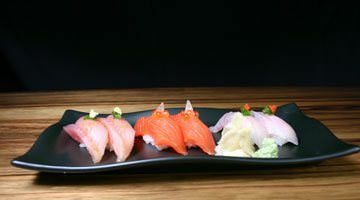 Some say it is an effort to appeal to a younger crowd, though the $220 prix fixe menu may put a damper on that idea. I think I would be a bit put off if I was paying $300 for a meal at a fine restaurant, and the first course arrived plated on an iPad. I’m old-fashioned that way. Previous Post: « Shalom Y’all, Pollo Bravo eshuffling, BYH Burgers Coming to Toro Bravo Inc.